The Okanagan Veterinary Hospital team of skilled veterinarians welcomes you to our practice, proudly serving the Kelowna area. At Okanagan Veterinary Hospital, it is our daily privilege to provide quality vet care to your cherished pet, with compassion and competence. We hope to ensure a positive impact on our patients, pet owners and the local community. Irene studied veterinary medicine at the Utrecht University in the Netherlands. Graduating in 2005, she then worked as a locum veterinarian in Holland and volunteered in clinics in Venezuela and Aruba. Ready for a new adventure, in 2007, she moved to British Columbia to practice veterinary medicine. Irene has a special interest in internal surgery and ultrasonography. During her work experience, she has developed extensive knowledge and a love of pocket pets, especially rabbits and rodents. Irene lives in Westbank with dogs Ali and Pepper, and cat Sammy. When she is not working, she likes to participate in outdoor activities such as hiking, mountain biking, camping, skiing, snowshoeing and dancing. Marco studied veterinary medicine and graduated with distinction at Utrecht University in Holland, which is one of Europe’s largest Veterinary Medicine Colleges and is fully accredited with the American and Canadian Veterinary Medical Associations. He practiced small animal medicine for nine years in the Netherlands before moving to Canada with his wife Liesbeth, daughter Marthe and son Luuk. 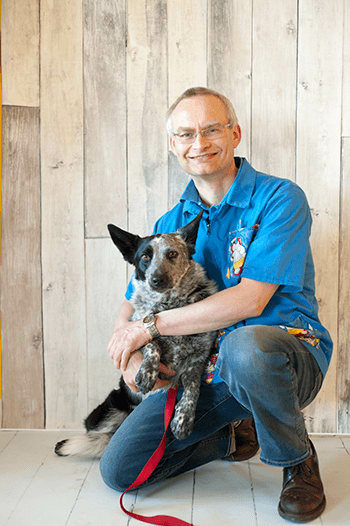 In 2002, Marco and Liesbeth purchased Okanagan Veterinary Hospital and built the practice to become a full service small animal hospital with a strong surgical component. The hospital completed an expansion and major renovation in 2008. An avid outdoor enthusiast, Marco can often be found hiking through the woods with his dog Bijke. 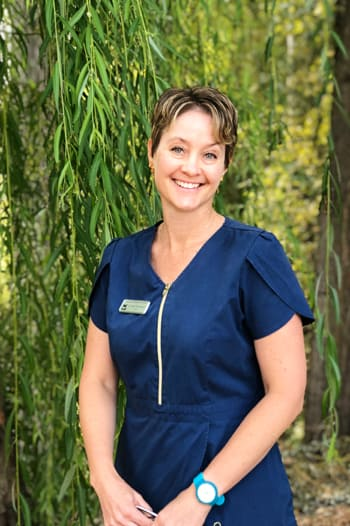 Eileen is new to Kelowna and joined our hospital as the Managing Veterinarian in August 2018. She completed a BSc in Agriculture at the University of Pretoria (South Africa) in 2003 and followed this with an Honours in Wildlife Management in 2004. 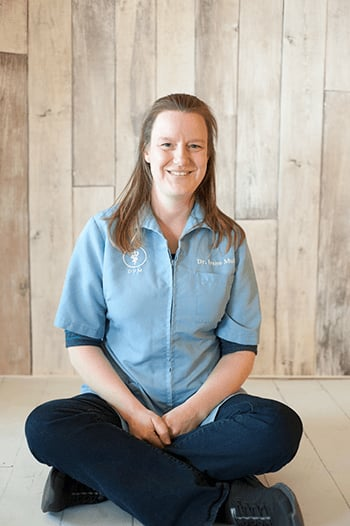 Eileen then spent three interesting years working in the United Arab Emirates as an ecologist, after which she went back to South Africa and completed a veterinary degree at the University of Pretoria, graduating in 2014. Since graduating she has spent a number of years working in emergency medicine and has a particular interest in internal medicine and ultrasonography. Eileen shares her life with husband, Roger, and three little dachshunds, Aero, Roanie and Cinnamon. Her spare time is taken up learning how to ski and discovering all that the mountain bike paths in the area have to offer.